Hundreds of people protested in Rio de Janeiro on Saturday, blaming Brazilian police for the death of a 10-year-old boy during clashes with locals in a favela. There has been tension since a military force was set up to fight drug trafficking. Eduardo de Jesus Ferreira was shot in the head as he played with a mobile phone in the entrance to his family home in the Alemao favela complex. The boy’s mother is among many who blame the police. He was one of four people to die in clashes between police and locals in a 24-hour period. The Pacifying Police Unit (UPP) says members of the Shock Battalion (BPCHoque) were on patrol in the area when local criminals shot at them. The UPP started to work in the Alemao favela complex, in the north of Rio, in May 2012. They formed part of a new, 24-hour policing system in the community, with the aim of cracking down on drug trafficking locally. Amnesty International was also represented at the demonstration, calling for a change in security policy. “We must break with the militarised (policing) model. And in particular break with the model of selective public security that chooses some (people) as citizens and others as “non-citizens” – a public security (model) that criminalises above all the young black man from poor suburbs. We are not against the police. The police, in a way, are a victim of that same security policy,” said Amnesty’s Director in Brazil, Atila Roque. 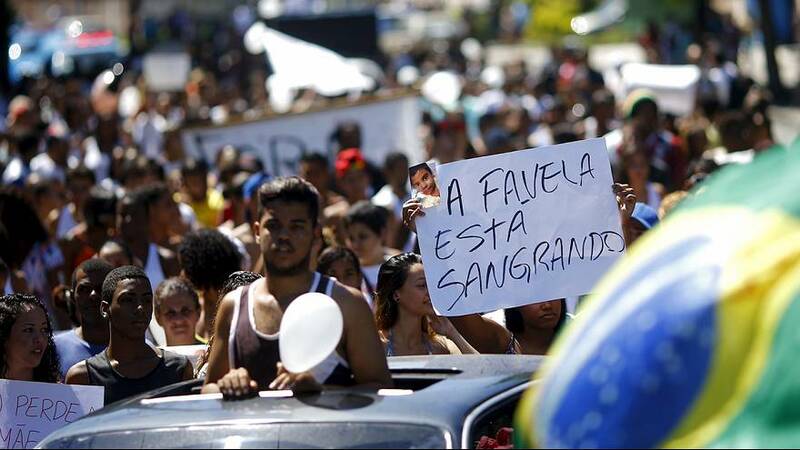 On Wednesday (April 1) evening, favela resident Rodrigo de Souza Pereira was shot in the head and died, and fellow resident Elizabeth Moura Francisco was shot in the face by a stray bullet whilst inside her house. Both died at the sites of the shootings. Also on Wednesday evening, favela resident Matheus Gomes de Lima was caught in a shoot out between police and drug dealers. He was taken to the Getulio Vargas state hospital but did not survive. The deaths prompted earlier protests on Friday, which started peacefully but then escalated – with police using tear gas and stun grenades to disperse the crowds. In light of the recent violence, the state Secretary of Security has now allowed the Military Police to reoccupy the complex.